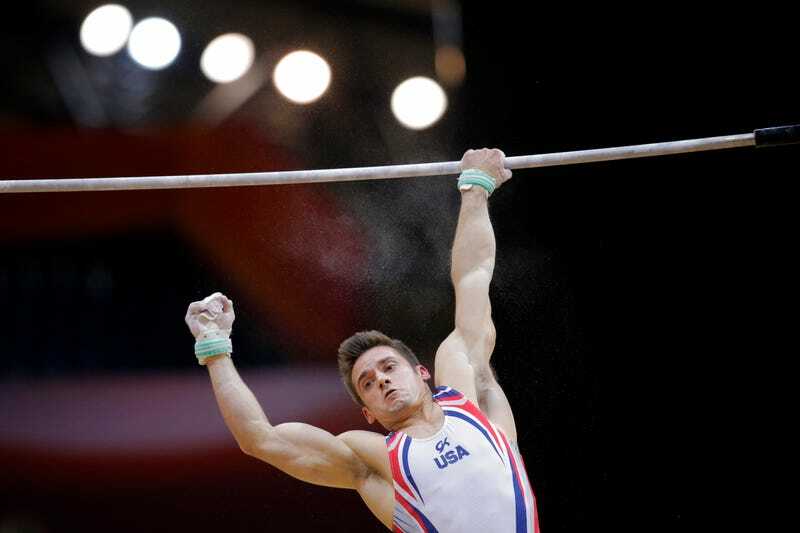 Back in 2013, Sam Mikulak entered the men’s all-around final at the world championships as the second-highest qualifier behind Japanese demigod, Kohei Uchimura. The gold medal was out of the question with Uchimura still very much in his unbeatable prime, but it looked like the American had a very good shot at making the podium. At that point in his gymnastics career, Mikulak was on the rise and had little to lose. He had been a member of the 2012 Olympic team that placed fifth in London but was still something of a rookie at those Games and not much was expected from him. The big names on the team that year were Danell Leyva, John Orozco, and 2008 Olympic high bar silver medalist Jonathan Horton; Only Leyva, the 2011 world champion on the parallel bars, walked away from those Olympics with a medal, a bronze in the all-around. Mikulak didn’t medal, but he performed well. He unexpectedly made the vault final in London, which was all the more impressive when you consider that less than two years before the Olympics, he broke both of his ankles. So Mikulak, the newly minted national champion, arrived in Antwerp in 2013 as the Americans’ best shot at an all-around medal. He seemed at ease with the expectation. During qualifications, he danced his way around the arena, hitting six sets to set him up for the final. And then Mikulak ended up placing sixth in the final. He had been in second heading into the final event, high bar. There, he caught all of his major releases but struggled on a swing, his arms nearly giving way. He had to muscle up back into the handstand. While it was impressive that he didn’t just fall off, the mistake cost him a spot on the podium. It’s hard to pin down exactly when this became Mikulak’s “story” among fans and sportswriters, but this is the narrative that Mikulak lives with, and within—an immensely talented and likable gymnast who just can’t ever seem to put it all together when medals at the world championships or Olympics were on the line. For some observers, that story might’ve begun 2013. At nationals that year, he had already shown flashes of inconsistency even as he won the overall title. It was 2014 for me. That year, I attended nationals and world championships. At the former, I watched Mikulak make mistakes on the first day only to storm back and hit all six events on the second day. He won his second national title on the strength of that Day 2 performance, but such comebacks wouldn’t be possible at worlds. If he dug himself a similar hole in China, against the deep international field, there would be no climbing out of it. And that’s exactly what happened. Mikulak struggled in preliminaries, placing 17th, and improved only marginally in the final. He finished 12th. Mikulak did walk away with a medal from those championships, a bronze he won as part of the team. In the team final, he performed very well. He hit the three events the U.S. needed him to hit in a close contest with Great Britain with the bronze on the line. But only Levya and Jake Dalton won individual hardware in Nanning. By that point the story of Mikulak—of enormous potential coupled with an inability to hit consistently in major international competition—had started to crystallize. Maybe these misses were all random events; the concept of “clutch” is as subject to debate in gymnastics as it is in any other sport. But, fairly or not, the script was set, and people started seeing patterns. And maybe Mikulak started seeing those patterns, too. Mikulak, of course, is hardly the only gymnast to fall in competition. Everyone does; the sport is incredibly challenging and there’s no way anyone can hit all the time. But the story of Mikulak and his mistakes is different. For instance, Russian Olympic champion Aliya Mustafina is known for not looking great in practice and then often not looking so hot in qualifications, either. But in finals, she always turns it up a notch and somehow ends up on the medal podium. The narrative that fans have created about her mistakes has been one of resilience, and of not doing her best until she absolutely has to. Uchimura, the greatest male gymnast of all time, has also had bad days. In 2012, he performed so poorly in preliminaries that he didn’t even rotate with the top-seeded group in the Olympic all-around final. (In the all-around, athletes are seeded in groups of six based on where they placed in the top 24 after preliminaries.) Uchimura, the favorite to win the title—he was the world all-around champion from 2009 to 2011 and the silver medalist at the 2008 Olympics—finished all the way down in ninth in prelims. But when the medal was on the line, he got it together and won the gold. No one really thought it was going to play out any other way. As with Mustafina, there is the general belief that Uchimura will somehow pull a rabbit out of his hat to win. A small part of me believed that he would be able to finish qualifications at last year’s world even after he injured his ankle on vault and even though I could see him limping badly from my spot in the media section. When he finally withdrew from the competition, I was a little bit shocked that he wasn’t going to finish qualifications and somehow go on to win his seventh consecutive world all-around title. Of course, both of those gymnasts have a lot of wins to their name, medals won over the course of several years. Fans frame their mistakes more charitably because both Mustafina and Uchimura have earned their trust by hitting more than they missed and, more significantly, hitting when the stakes are the highest. Does that trust matter to the gymnasts? Do what fans and others believe about an athlete’s ability to compete impact the way that gymnast performs? There’s no way of knowing for sure, but I have a hard time believing that some of this doesn’t seep in. I also have a tough time believing that years of negative framing and frustrating results, the broad and broadly shared belief that falling short at the worst possible moment is inevitable, doesn’t also find its way in even if you don’t read the comments on the internet. Mikulak has hit in major competition, even if he hasn’t come away with an individual medal. In 2016—he missed the 2015 worlds due to a partially torn Achilles—he placed fourth in the high bar final at the Olympics, just 0.06 behind Nile Wilson of Great Britain. If it had gone the other way, which it easily could’ve, the narrative around Mikulak would’ve shifted at least a little. And winning an Olympic medal, beyond changing the story, would’ve also been a tremendous personal accomplishment. He was out with injury for most of 2017—another Achilles—and only competed on high bar at last year’s world championships. It’s his best event and also one of the most unpredictable in men’s gymnastics; as a result, almost anyone who makes the high bar final has a reasonable chance of medaling. Mikulak fell in the preliminaries and didn’t end up qualifying. This was supposed to be the year that Mikulak put it all together. That was the story that was being told in the media, anyway. Mikulak was healthy heading into 2018, and talked about having a new mental approach to the sport and being less stressed. (He had adopted a puppy, which is maybe more important to me than anyone else, but I believe in the power of puppies to do anything.) All the articles about the five-time national champion in the lead-up to the world championships noted that he was still searching for that individual international medal. There’s no question that Mikulak did everything in his power to prepare for the world championships. He competed brilliantly in prelims, qualifying into the all-around in third place and making four apparatus finals, too. During the team competition, he hit five-for-six, and his fall from pommel horse didn’t really change the outcome. The U.S. men finished fourth, which was realistically the best they could’ve hoped for given the depth of the field. And then came the all-around final. Yesterday’s all-around final was one of the most intense I’ve ever watched, surpassing even the 2016 Olympic one that featured an epic showdown between Uchimura and Oleg Verniaiev of Ukraine that came down to the final event—it’s always high bar if you’re in the top group—and a fraction of a point. In Doha, it wasn’t just two gymnasts but the entire top group that was hitting everything from the very first event. Mikulak was keeping pace, nailing his routines just as his nearest rivals were doing. With each hit routine and stuck dismount, the pressure built. I felt increasingly uneasy, because I felt like someone in that top group had to make a mistake. The top group was on high bar for the final rotation. In Doha, Mikulak qualified to the high bar final in second place. And during the team final, he recorded the highest score on the event. He was in third place in the all-around but the standings were so close at the top that it was really anyone’s contest. A good routine would all but guarantee Mikulak a spot on the podium. You know where this is going: Mikulak’s grip slipped after a release move. He somehow managed to hold on and not fall off the apparatus, but the major break in form and rhythm was enough to knock him out of medal contention. Mikulak ended the competition in fifth place. His routine, even before that error, was a little tentative. He caught his first two release moves close, a little too close. He was clearly being cautious, trying not to fall as opposed to just going for it. Mikulak, afterwards, was understandably disappointed, and sadder than I’ve ever seen him before. He’s typically a happy-go-lucky guy, friendly and chatty in the mixed zone, even after far-from-perfect performances. “Throwback to 2013. Should’ve done it, man. You had your chance,” he said. It was impossible to escape the sense that he already knew the story that has been told and re-told about him since then. It was hard not to believe that he’d been telling it to himself. It’s not over for Mikulak yet at these championships, not by a long shot. He has four event finals and a credible chance of winning a medal on at least one of them. His very best opportunity comes on the high bar, the event that let him down yesterday. But in men’s gymnastics—especially on high bar—anything can happen. That means Mikulak can get an individual medal, and finally start writing the story he wants to tell.